For several decades, lobe and multistage blowers were the tried-and-true blower technologies for wastewater treatment plants. Over the past 15 years, the demand for increased energy efficiency has led to major advances in aeration equipment. Single-stage integrally geared centrifugal blowers, positive displacement screw blowers and high-speed direct-drive centrifugal blowers can greatly reduce a plant’s power consumption. Prior to the 1950s, untreated wastewater was regularly released to U.S. rivers and lakes. The Clean Water Act of 1972 set firm treatment requirements. 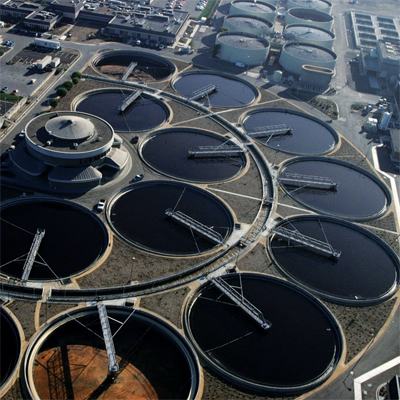 Wastewater treatment requires aeration of treatment basins, and blowers provide the air to meet this demand. When the U.S. began implementing wastewater treatment plants in the 1950s, the lobe blower was the most common technology used to move air. The original lobe blower had two counter-rotating shafts with lobes that move air from one side of a casing to another. Improvements have been made to this design over time, but the operating principle remains the same. Multistage centrifugal blowers have a simple design concept. Air is accelerated and diffused in multiple stages, meaning that higher pressures are achievable by adding additional “stages” to a machine. In addition, impeller designs can be more backward curved (less pressure rise, more efficient) or more radial (more pressure rise, less efficient). These factors suggest that a multistage centrifugal machine could be created with thousands of possible combinations. The final outcome is a more efficient blower to run a given design point. The advantages of multistage blowers are offset by a higher cost than a lobe blower, as well as some performance considerations. The flow from a multistage machine—or any centrifugal machine—changes with the machine discharge pressure, meaning a process with pressure fluctuation delivers different flows. Single-stage integrally geared centrifugal blowers use a single-stage impeller design, and the drive shaft and impeller operate at much higher speeds. This is achieved with the use of tilted-pad oil film bearings that limit the friction losses found in traditional roller bearings, or with high-precision ceramic roller bearings. In addition, integrally geared machines often are provided with variable discharge guide vanes, which allow the efficiency of the machine to be adjusted across its flow range. The gearbox and oil film bearings push the cost of these machines higher, but very large flows can be achieved, and it offers efficiency across the operating range. The positive displacement screw blower was introduced in the 1990s. Based on higher-pressure screw compressors, screw blowers are single-stage machines designed for pressures below 20 psi. Screw blowers operate on the same principles as lobe machines, but air is compressed moving along a screw element before being discharged, while a lobe only moves air from the inlet to the outlet port. With a lobe blower, compression happens in the process piping downstream, which is not as efficient as screw compression, meaning the screw offers significant energy savings. High-speed, direct-drive blower technology was revolutionary in blower efficiency, employing either air bearings or magnetic levitation bearings, thus eliminating bearing friction losses and allowing for high operating speeds. Every high-speed blower is run with the use of a variable frequency drive to allow the high operating frequency. No bearing losses and the use of permanent magnet synchronous motors help ensure high-speed blower efficiency. Air foil bearings offer the same advantages as magnetic bearings for a lower price, but still cost more than other options. When these technologies became prominent in the early 2000s, the wastewater industry rushed to implement them in plants. It would come about that the air-bearing designs of early high-speed models were not as robust as originally thought, leading to high numbers of blower bearing failures. Air-bearing designs have stabilized over recent years, but a large portion of the industry still relies on magnetic bearing technology or with alternative technology. There have been several advancements in aeration technology in the past few decades. All the equipment discussed still have a place in wastewater treatment plants, depending on the design requirements, available capital, and what is valued by the plant. Travis McGarrah is product marketing manager for blower products for Atlas Copco. McGarrah can be reached at [email protected] or 281.840.0468.